Maldives is home to some of the most diverse marine fauna and flora in the world. Tens of thousands of reefs, a thousand recorded species of fish, over two hundred species of coral and hundreds more species of other marine life; no wonder many see this as one of the greatest dive destinations on earth. The dive center is one of the most important facilities in any resort. Each resort has a dive center and are staffed by qualified dive instructors. Divers may, if they wish, bring along their own dive gear, however the centers carry a wide range of rental equipment. At resorts diving is conducted daily all year round. Even in Malé there are some dive centers, mainly serving the residents of Malé. There are two decompression chambers in the Maldives located in Kaafu Atoll and Ari Atoll. There are thousands of dive sites; so numerous that you can literally swim over from one to the other. Only a small percentage of the Maldives reefs have ever been dived. Each dive site has its unique characteristics in form, fauna and flora, the currents and other elements that shape and mould them. Resorts concentrate on dive sites within a one or two-hour radius, while cruise boats cover more ocean and therefore a greater variety of sites. All resorts without exception have water sports centers that provide a range of water sports and fun activities. The most popular among these are snorkeling, windsurfing and catamaran sailing. The water sports centers are equipped with boards and sails of different sizes and some offer courses for beginners and advanced windsurfers and sailors. 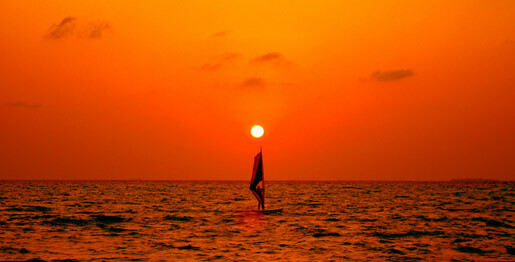 Among other popular water sports activities are parasailing, kayaking, kite-surfing, water-skiing and jet skiing. Some resorts even offer you the opportunity to try out your sailing skills on a local dhoni. Today surfing is the fastest growing water sport in the country, with several surf breaks that are documented and well-known by surf enthusiasts. The most important surf event is the annual Ã“Neill Deep Blue Contest which has placed Maldives firmly on the world’s surf map. The best season to surf in the Maldives is the Southwest Monsoon from April to October. Surfers are most likely to enjoy the biggest swells from June to September. The surf generally ranges in size from 3-8 feet. The best known surf breaks are in the North and South Male’ Atoll and most surfers stay in resorts close to these breaks. However cruise operators offer specialized surfing cruises, that give you the opportunity to test some of the less known surf breaks in the atolls further away from Male’ Atoll.